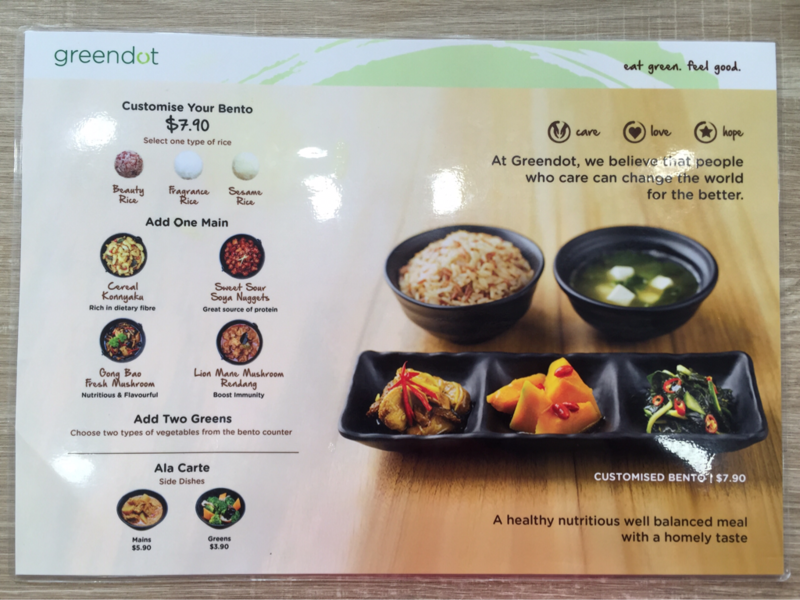 GREENDOT: Eat clean, go green. 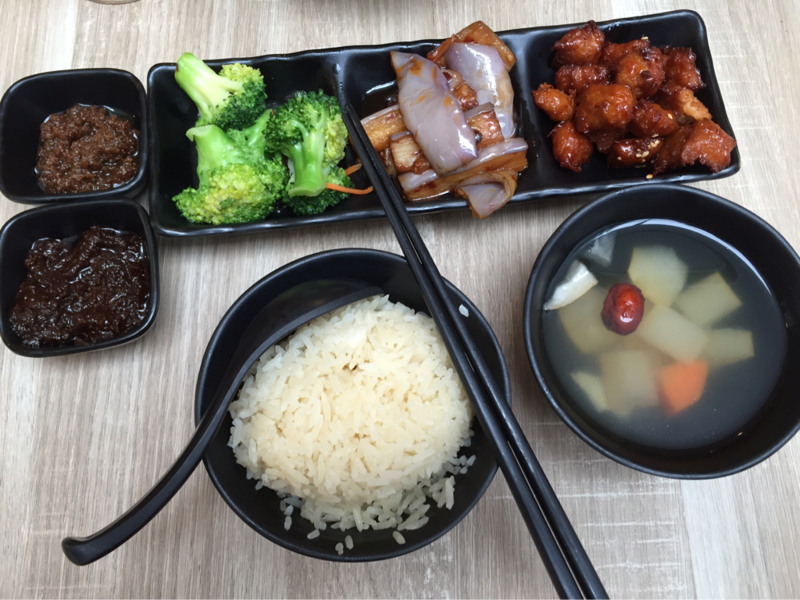 Greendot has always been one of my favourite casual restaurants to go for quick but delicious vegetarian lunches! I have been here about four times as of today and tried a lot of the dishes on their menu. Thus far, all the food I've tried has never failed to impress me! Not only are they delicious, they are also nutritious and good for our bodies! "We believe that eating has a greater purpose. Just by going meat free once or twice a week, we can take a step towards making a positive impact on ourselves, our community and the environment. Yet, we found it hard to get fresh, healthy green food options that were both satisfying for our tastebuds and our pockets. 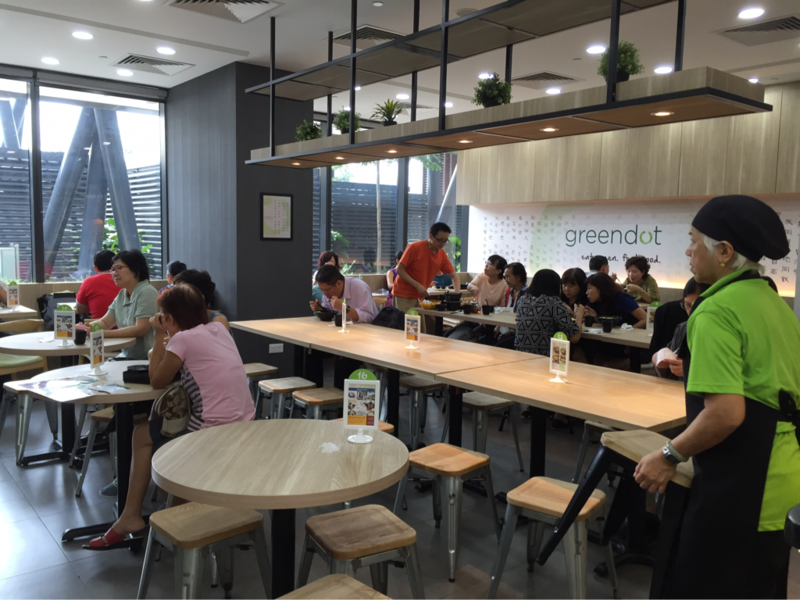 And that was how GreenDot was born – to change the world one delicious green meal at a time. Be it to help people improve their personal health or care for their families, or to save the environment, we want to make it easy for people to take that first step. The place is clean and well-furnished. There is also a counter serving smoothies for those who need a drink to go with their food. 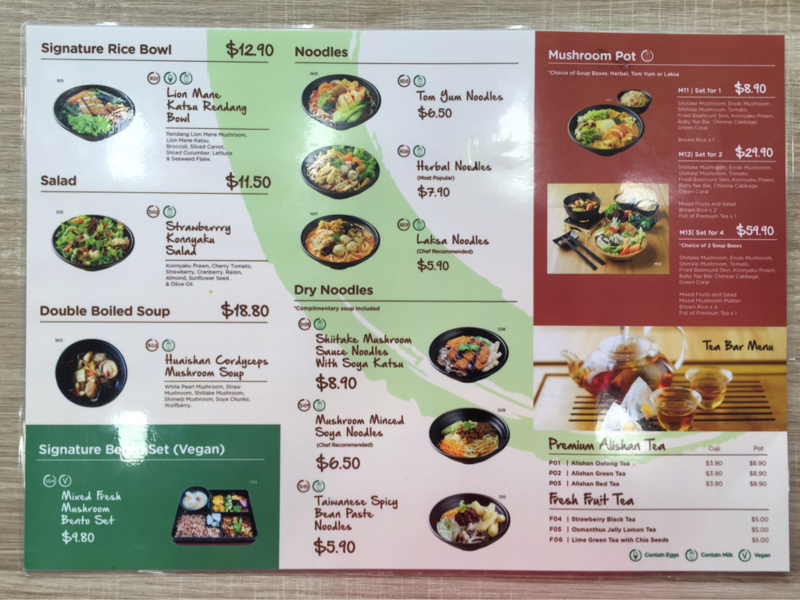 The ordering system goes this way: If you're ordering a bento, tell the lady at the bento section your order, before proceeding to the counter for payment. 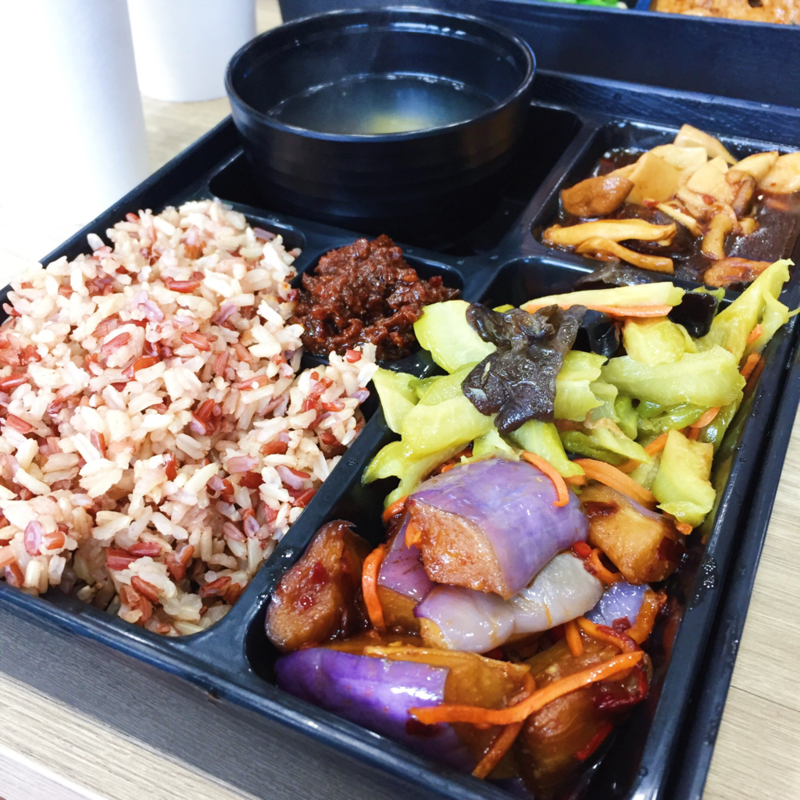 The other food that you would like to order on top of your bento must be purchased directly from the cashier. If you're not ordering the bento but ordering other food instead, you may proceed straight to the cashier to purchase your food. There are plenty of seats available inside the shop itself, though it may be a bit cramp and slightly difficult to walk to your table. 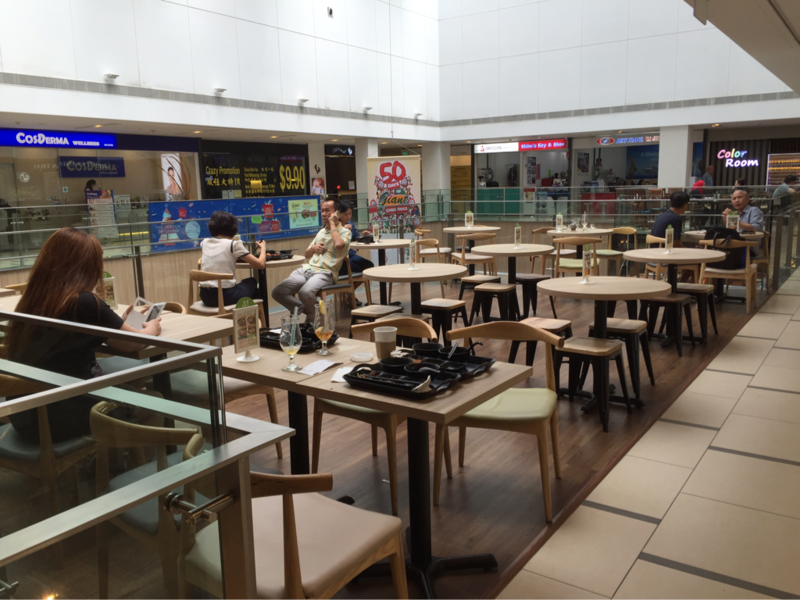 However, since the restaurant is so popular especially during lunch hours, there is also an outdoor seating area. This area has good lighting and is more spacious than inside, thus this is my preferred seating area whenever I dine at Greendot. 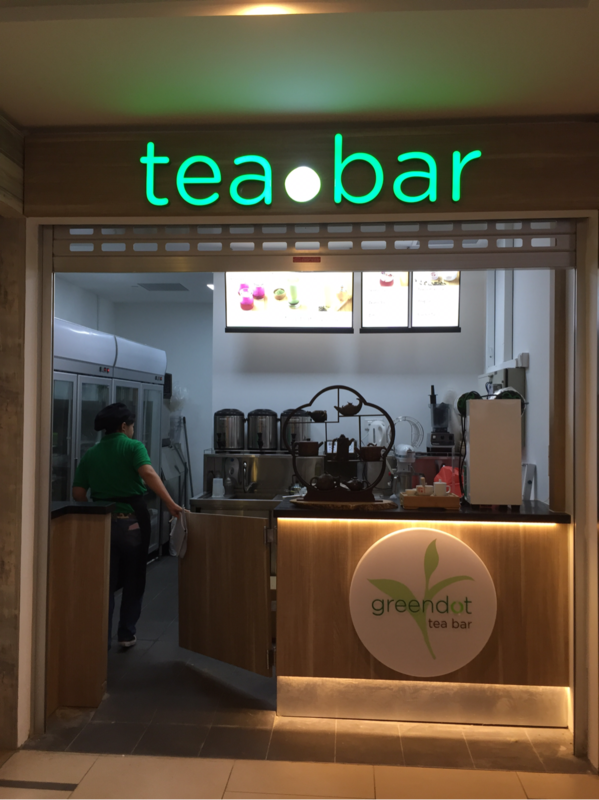 There is also a tea-bar opened by Greendot nearby, just one shop space away from Greendot itself. 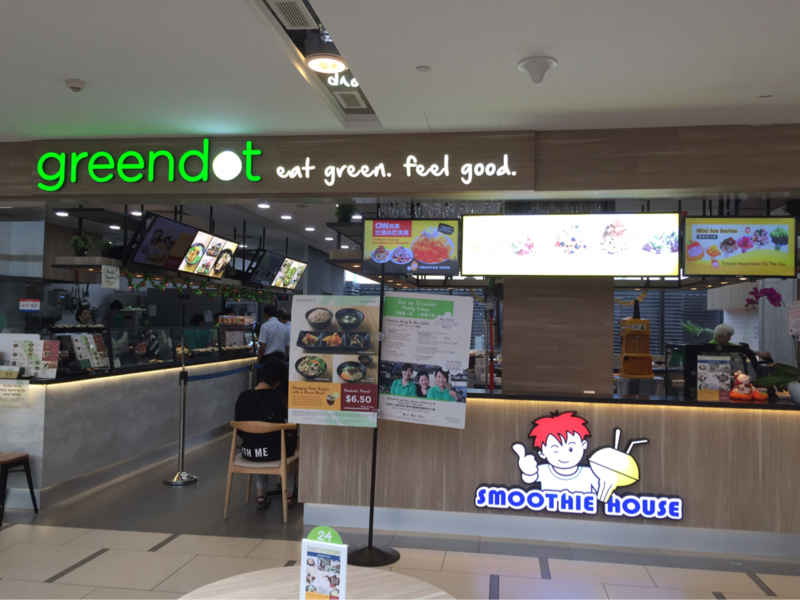 Greendot serves up a good variety Asian vegetarian food, with the options of soups to salads and noodles to rice, to cater to all types of cravings. They also indicate next to their dishes which dishes contain eggs and which contain milk, so that customers can order according to their various special dietary requirements. However, unfortunately for vegans, the only available option is their mixed fresh mushroom bento set. 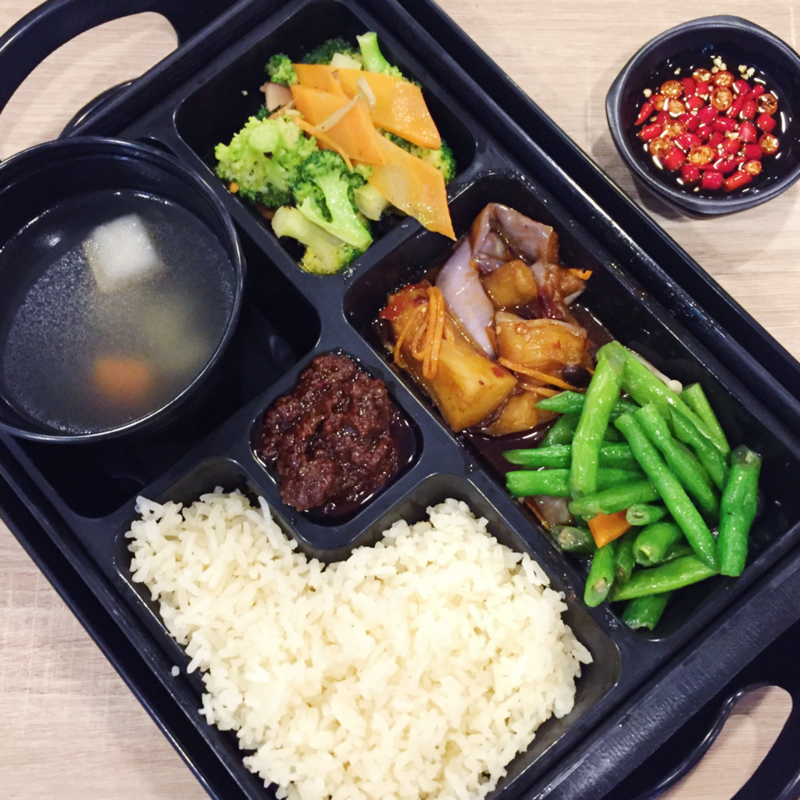 The bento comes with one choice of rice (sesame rice which tastes like chicken rice, beauty rice which is brown rice, fragrance rice which is white rice), one choice of protein (cereal konnyaku, sweet sour soya nuggets, gong bao fresh mushroom, lion mane rendang mushroom) and two choices of vegetables (choose from those available at counter). 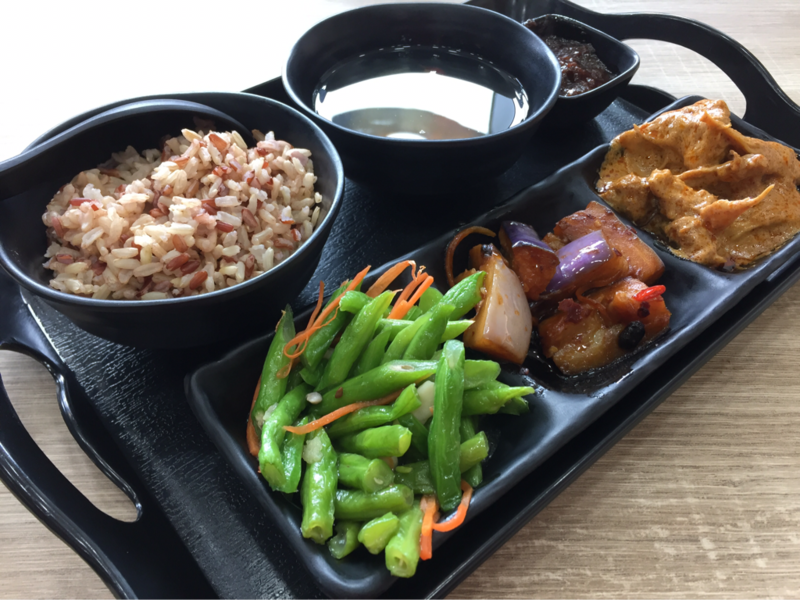 On my first visit, I chose the beauty rice as my rice, lion mane mushroom rendang as my protein, and pumpkin and French beans as my vegetables. The beauty rice looks like a mix of a few different types of rice, giving the rice a contrast in texture. The rice itself was soft and tender, while the pearls of barley and mixed grains added a nice chewy mouthfeel. The lion mane mushroom rendang was LEGIT. The mushroom itself was firm, possibly due to the nature of the lion mane mushroom, giving it the chewy texture of meat. The sauce it was cooked in was very similar to that of the original, just less oily and less spicy. Sometimes, I feel that the original rendang, which is cooked with beef, is too spicy and oily. This version, however, is perfect! I really really enjoyed it. The pumpkin was cooked pretty simply, enough to not mask the original sweetness of the pumpkin. It was soft and tender but in my opinion, should have been cooked slightly longer in order to obtain a creamier smoother texture. The long beans were cooked with garlic, carrots and mushrooms, in an Asian-flavoured broth. These long beans were cooked perfectly - well-cooked though yet retaining its crunchy texture. It was also really tasty and flavourful. The soup contained carrots, wintermelon and longans but was was quite bland and had nothing special. The sambal chilli is the main highlight of Greendot in my opinion - its saltiness and spiciness are all on point - I've never tasted such a tasty sambal chilli in my life. The barbecue sauce, however, did not taste like barbecue sauce and was too salty for my liking. My advice is just to stick with the insanely delicious sambal chilli, which I take at least 5 saucers of every time I visit Greendot. 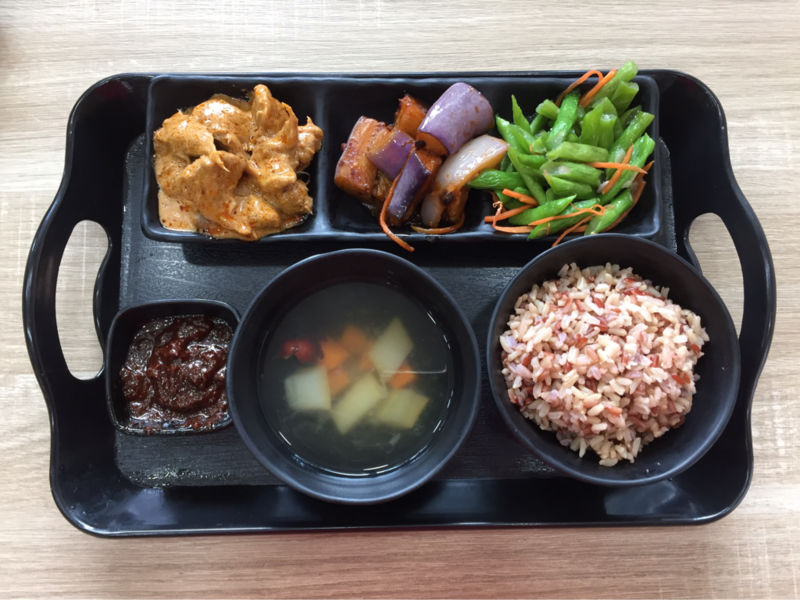 On my third visit, I had the exact same bento with only one different vegetable of eggplant instead of pumpkin. Everything was good as usual and I was actually really impressed by the eggplant. It was firm on the outside, but soft and tender on the inside. It was also cooked in a slightly spicy sauce which was full of flavour - a spicy eggplant stew of some sort. This time, I took five saucers of sambal chilli as per normal. Greendot should really start selling their chilli by the container - I would buy it EVERYDAY. This was the bento box I has on my second visit. I chose sesame rice as my rice, sweet sour soya nuggets as my protein and broccoli & eggplant as my vegetables. Firstly, I would like to emphasise how LEGIT this sesame rice tastes in comparison to chicken rice. Since young, I loved chicken rice not because of the chicken but because of the flavourful rice. However, I did find the rice too greasy for my liking and ever since I found out that the rice was cooked with chicken fat (totally unnecessary URGH), I totally abstained from it (even before I went vegetarian). This sesame rice, however, mimics the flavour of the chicken rice rice so well that even my brother who doesn't like vegetarian/vegan food had to admit that this tasted like the healthy but equally tasty version of chicken rice rice. I do have to admit that chicken rice rice is still has a slightly stronger taste than the sesame rice, but with all the cut out fat, oil and calories, sesame rice would definitely be a much healthier choice without compromising too much flavour. The sweet sour soya nuggets BLEW MY MIND. Upon my first bite of the soya nuggets, my jaw literally dropped. I seriously thought that I was chewing on real meat! I hardly ever say this about mock meats - even if the mock meat has the texture of meat, it's aftertaste will usually give it away. However, this soya nuggets not only had the chewy texture of meat, there was no aftertaste of soy or gluten AT ALL! It was fried and coated in a sweet soya sauce which was really tasty, which may be the reason why the soya taste can be masked. The eggplant and sambal chilli tasted as good as usual but the broccoli was slightly plain, in my opinion, cut in too huge chunks and not cooked through. This noodles is a chef recommendation and since I could get it at a discounted price by using the SUGAR app, I decided to give it a try on my second visit here! I got it at $2.50 instead of the usual price of $6.50 - a really good deal indeed! 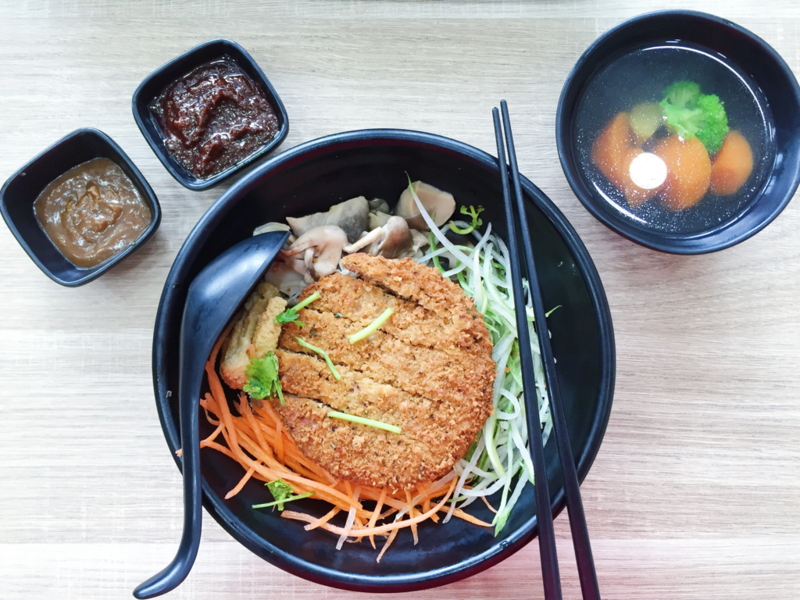 The noodles was coated in some sort of mushroom sauce, topped with minced soya, fried beancurd, mushrooms, carrots, cucumber and coriander. The minced soya was salty but not too salty, reminding me of the minced pork topping they put on the taiwanese minced pork noodles. It didn't have the aftertaste of soy as well, like the soya nuggets, which is very hard to achieve! 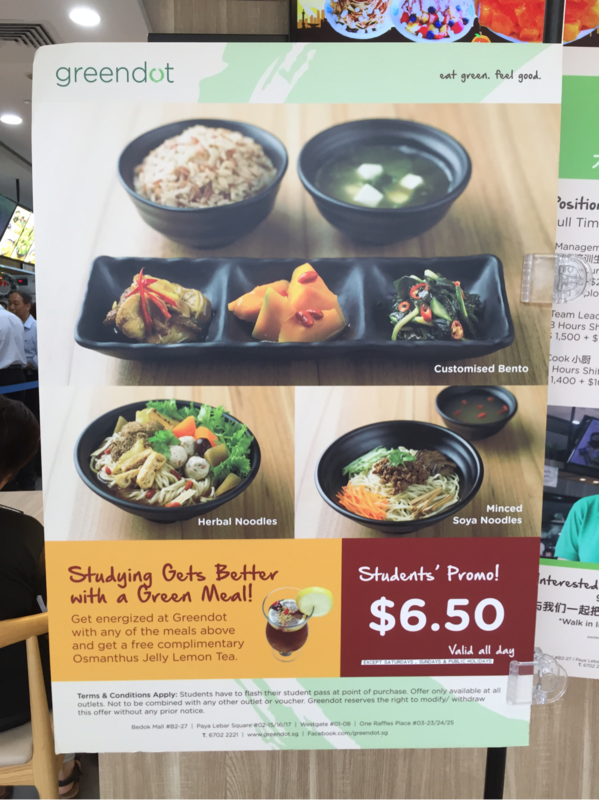 I think that Greendot is really doing their soya dishes right. 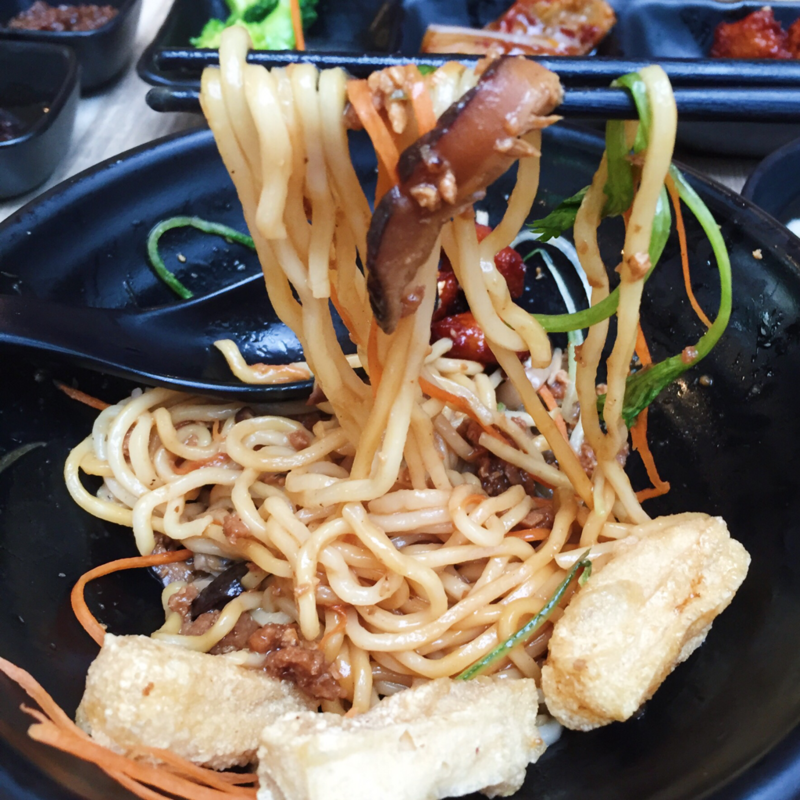 The vegetables were all fresh & slightly crunchy, adding a nice texture contrast to the soft and chewy noodles. Some people may not enjoy coriander (neither did I when I was young), but the addition of this coriander added a nice refreshing kick to the dish. However, I did not really enjoy the fried beancurd as it was literally deep fried pockets-of-air. The outside was slightly crispy, but the insides contained nothing other than a vague flavour of beancurd. The handmade you mian noodles were cooked to al dente, soft and well-cooked, yet chewy and QQ. I really all of Greendot's noodle dishes because of their noodles and their on-point sauces and toppings. Definitely a dish I would recommend to everyone. 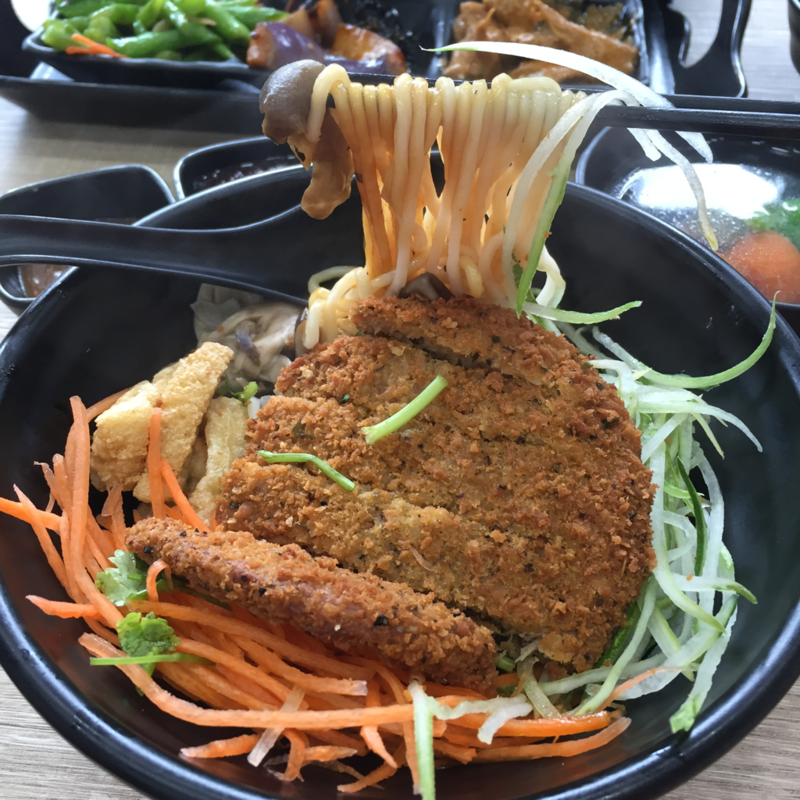 This was the shiitake mushroom sauce noodles with soya katsu, which comes with the same you mian noodles as the other noodle dishes, coated in the same mushroom sauce, topped with fried beancurd, mushrooms, carrots, cucumber and soya katsu. 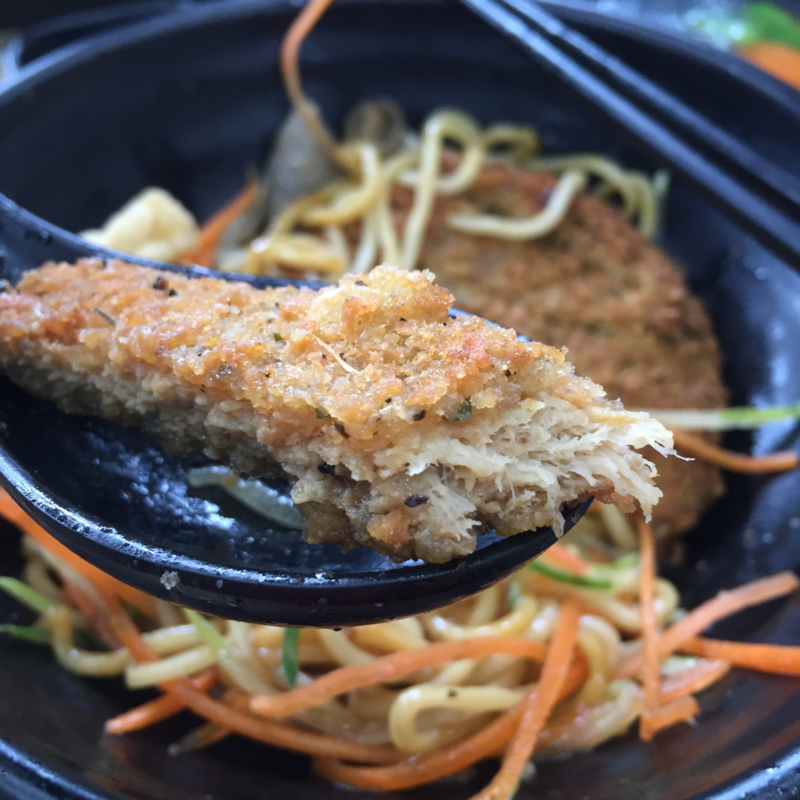 Basically, it's the exact same thing as the minced soya mushroom noodles just that the minced soya is replaced with a glorious deep-fried golden brown crispy soya cutlet. The noodles were just as springy as before, the vegetables were as fresh and crisp as usual and the mushroom sauce was equally tasty and well-seasoned as before. The highlight of this dish is definitely the soya katsu. Previously, all the soya components of all the dishes, be it minced soya or soya nuggets, was done very well and this soya katsu is no exception. The soya meat was stringy yet tender, with a large similarity to chicken. However, because this version of soya is in a patty form, the aftertaste of soybeans was slightly evident. Nevertheless, the crust of the soya katsu was perfectly crispy and golden brown and seasoned to perfection - you can literally see the black pepper and herbs running throughout the exterior of the soya katsu. I really really enjoyed this dish, especially the soya katsu, which gave it a slight edge over the minced soya mushroom noodles. This was the laksa noodles my brother had on my third visit here, which I tasted a bit of. This laksa is made from scratch with blue ginger, yellow ginger, chillies and laksa leaves. 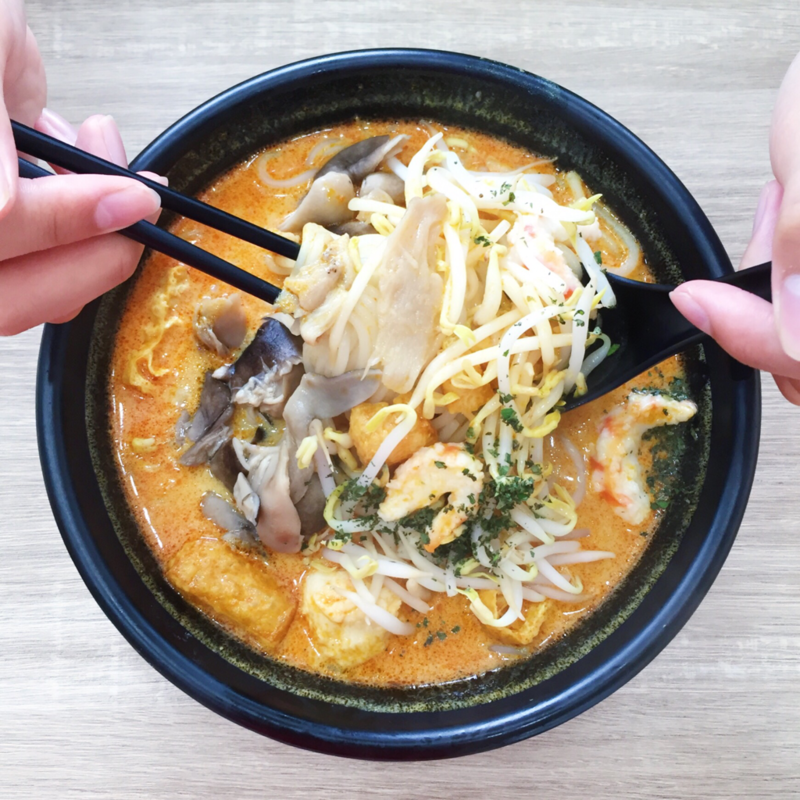 It contains laska noodles, konnyaku prawn, konnyaku slices, konnyaku fishballs, tau pok, mushrooms, beansprouts and laksa leaves. It was served steaming hot and the fragrance of laksa leaves was also evident. The noodles used in this dish is rice noodles, the typical type of noodles they use in laksa, which is different from that of the previous two dishes. As compared to the you mian noodles, this rice noodles are less chewy and filling but more springy and light, which goes perfectly with the light coconut milk-based laksa broth. With the addition of the laksa leaves, the broth was fragrant, creamy, yet not too spicy. The consistency of the broth was also thin but not diluted, perfect to drink as a soup together with the noodles. The beansprouts were fresh and added a nice crunch, the mushrooms were tender, the taupok soaked up the soup like a mop such that when you bit into them the delicious soup would fill your mouth. 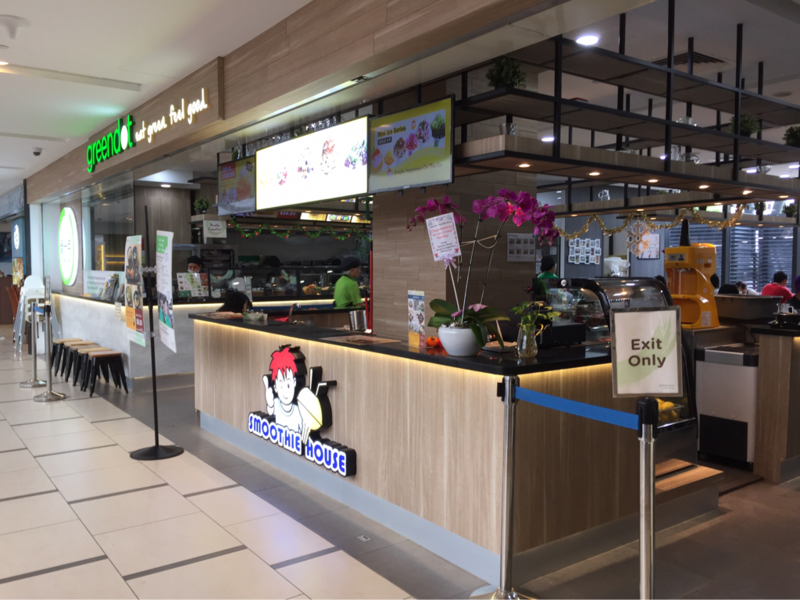 The toppings are also very similar to that of the original laksa - konnyaku prawns instead of the normal prawns, konnyaku fishballs instead of the normal fishballs, konnyaku slices instead of the normal fishcakes. However, my qualm with the konnyaku mock meats were that they did not actually taste very good. They had a very odd fishy taste even though they did not contain any fish meat at all! The fishy taste was so pungent, I could hardly keep one single bite down. 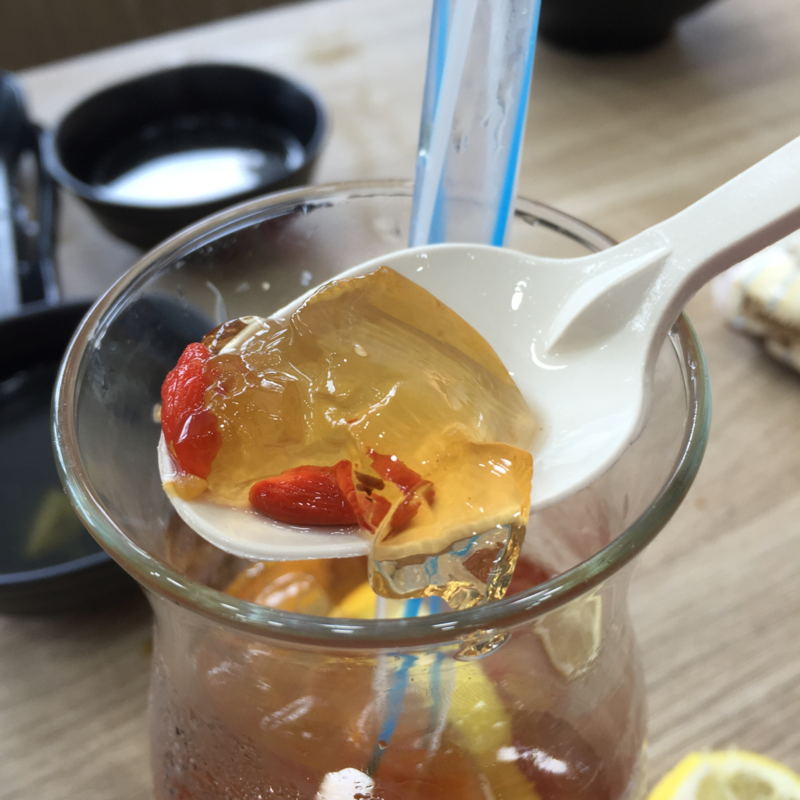 This osmanthus jelly lemon tea came free together with my student meal on my second and third visit. This drink is essentially ice lemon tea with osmanthus jelly and lemon slices. 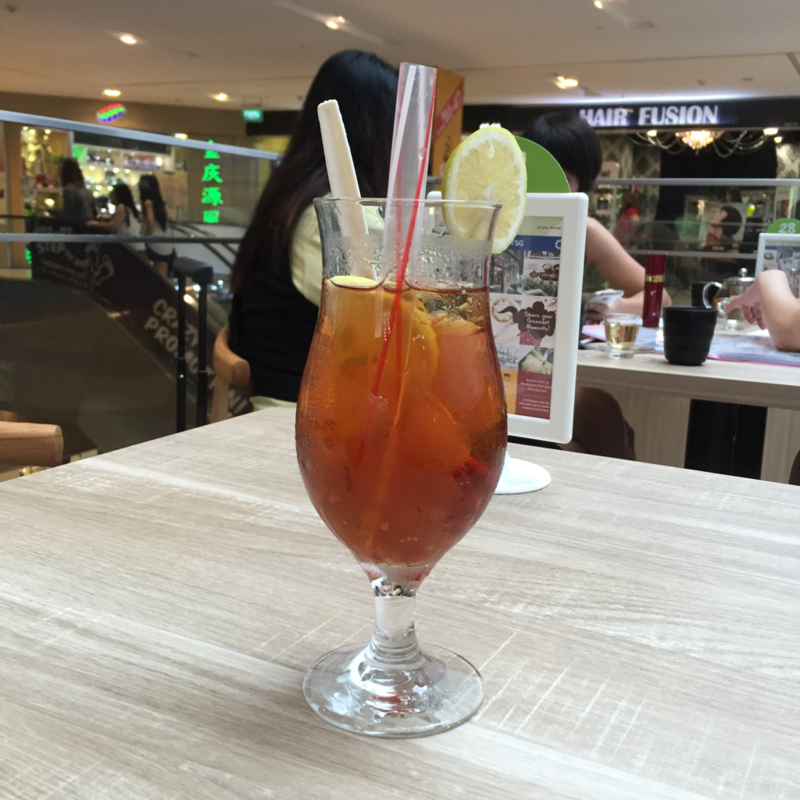 The ice lemon tea itself is really really good - with the perfect hint of sourness from the lemon and not too sweet unlike the usual store-bought lemon teas. However, I feel that if the taste of the tea could be stronger, the drink would be perfect. The osmanthus jelly (pictured) is really good as well! The jelly also had a floral taste, since osmanthus is actually a flower. The jelly also contained wolfberries (also known as goji berries), which are not only nutritious, but also added good bite. The addition of osmanthus jelly is a pretty good idea as it reminds me of the herbal jelly that is added to the Taiwanese drinks, probably only slightly less firm. I definitely would recommend this drink to go with any of the dishes to make up the perfect lunch! 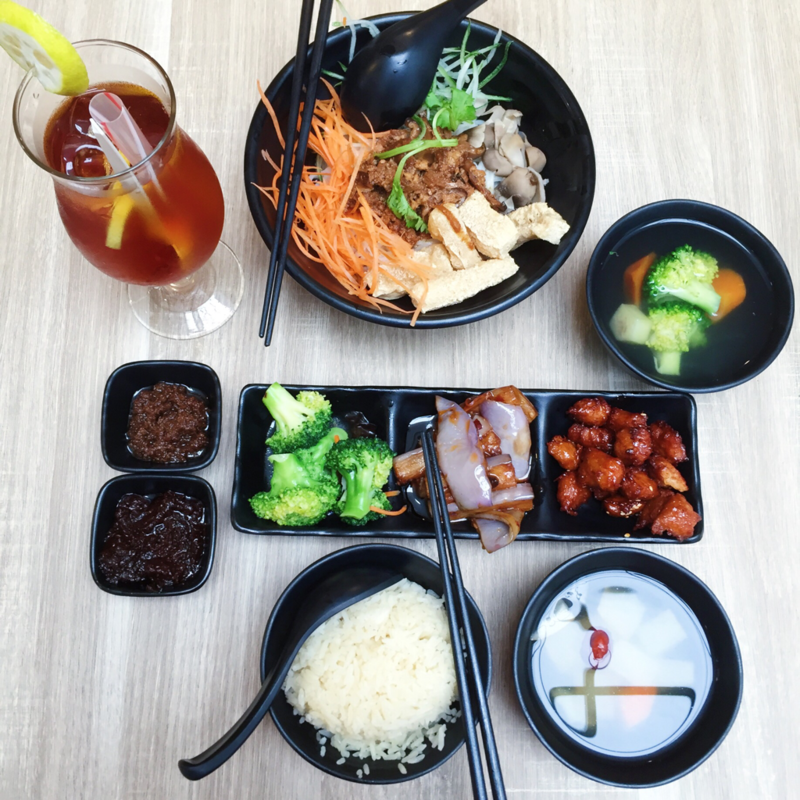 Overall, the dishes here at Greendot not only very well-priced, but also nutritious and delicious as well! 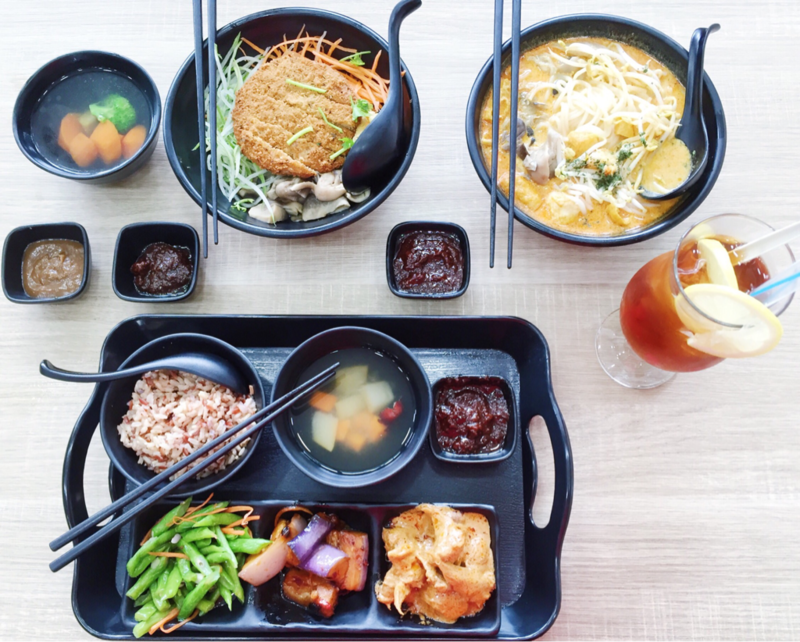 My favourite dishes from here would have to be the bento set, with the savoury lion mane mushroom rendang and the chewy sweet sour nuggets, as well as the mushroom sauce noodles with soya katsu! 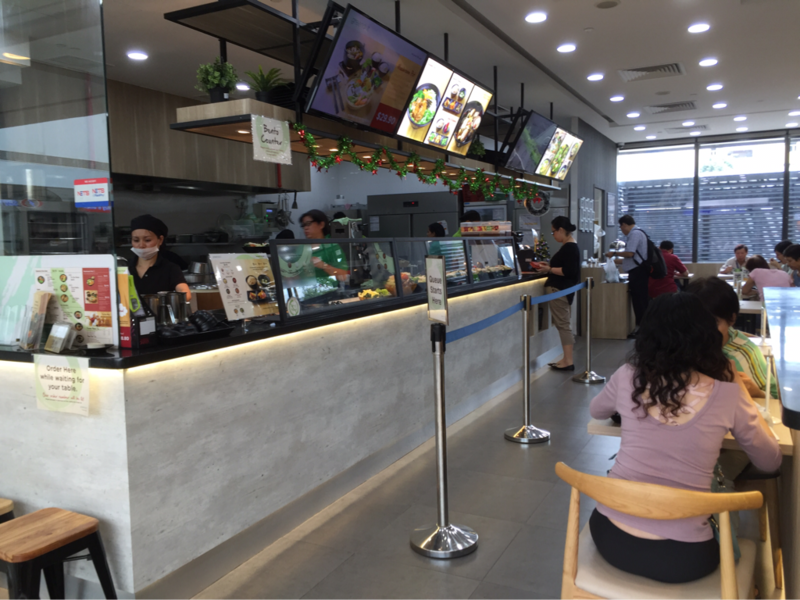 Especially during mealtimes, you can always see the shop packed full with people and indeed, the food here is not overrated as it is really really good. 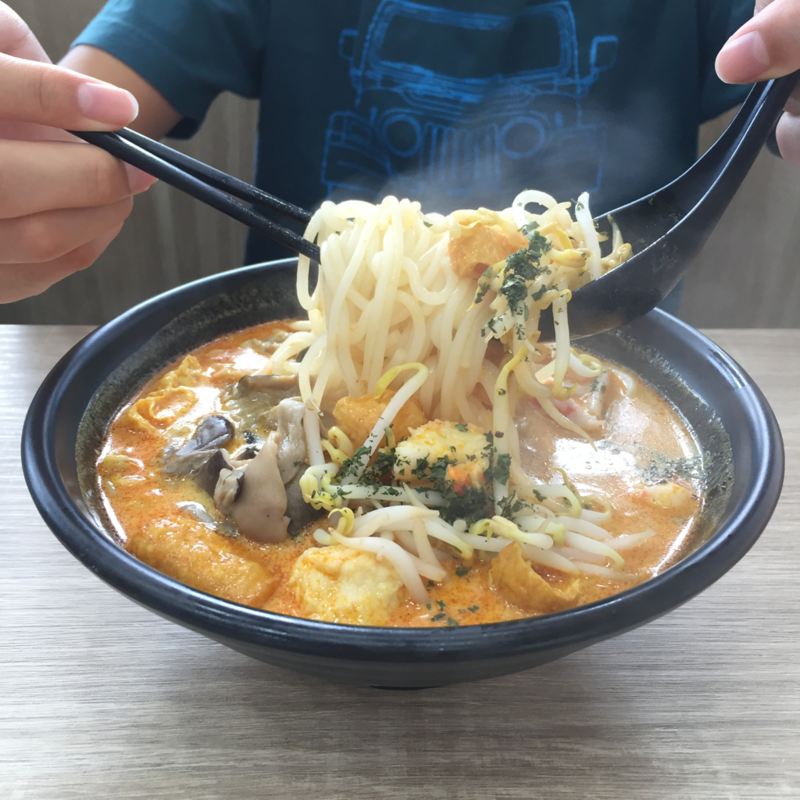 I will definitely come back to try some of their other dishes as soon as possible, such as their lion mane katsu rendang bowl and their tom yum noodles!